One of the best selling Givi Monolock Topcase’s at GhostBikes, Givi E450 Simply 2 topcase is widely touted as the most capacious case in GIVI’s popular MONOLOCK® range. The top case has 45 Litre’s of space and is very reliable when you need space for long journeys. Its Large capacity can hold 2 full helmets which is convenient if one is travelling with a passenger. Just like Givis’s E260 MICRO 2 and E350 FLOW, E450 has also been equipped with an automatic opening/closing system. Opening the case is really simple. All it takes is pushing one button which can also be open even if you are wearing your gloves. Detachment is just as easy. With a mere rotation of the key and light pressure on the red button the case will become detached from the motorcycle. If the case is closed incorrectly then the new security system will resolve that. Pressure with your hands would bring the hinge to the correct closing position. The E450 Simply 2 topcases are smooth in style and simple in design with a flawless durable finish and is a great choice for all types of bikes. 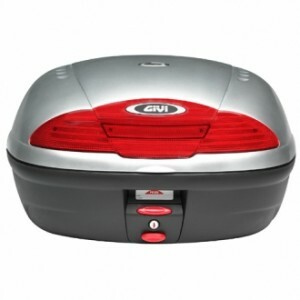 The top case features the Givi Monolock design. This Monolock style, unique to certain Givi top case’s that enables the luggage to be both locked/unlocked and removed completely with one twist of a key and it must be used with a special fitting plate which is included. Unfortunately this case will not fit Givi Monokey racks or their Givi E series top racks. This fabulous Topcase is available in 3 shades with other features that include Givi E450 Simply 2 Top Box, 3kg of Ma weight, 2 keys and a universal fitting kit which is included. 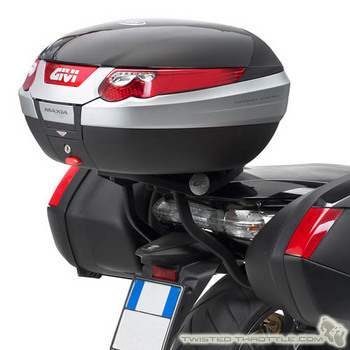 For a full collection of Givi Monolock Top cases please visit GhostBikes Official Givi Motorcycle Luggage Department.